Why you should go there: Old photos and newspaper articles, signage from long-gone businesses. There are so many “blasts from Canandaigua’s past” in this bar that you’d think the local historical society annexed the joint. Why people used to go there: To drink. Illegally. The Green Front originally opened in 1928 as the Italian-American Restaurant, but it doubled as a speakeasy until Prohibition was lifted in 1933. Booze-thirsty locals code-named it The Green Front (because the front of the building was green—how clever) and the name stuck and eventually became the bar’s legal moniker. The building is still green. What else you should know: The food is a little bit of a throwback too. Vintage bar food that has an undeniable Finger Lakes ring. Hamburgers or friend bologna “on the heel” (that’s code for the end of a loaf of French bread). In addition to the fine selection of local craft beers, everything you used to steal from your dad’s budget canned beer collection is here. Why you should go there: Look up at the ceiling and you’ll see how a former employee repurposed used shotgun shells from patrons as lighting fixtures. She went on to a career in health care, not interior decorating. A little history with that beer: The town that is now Naples used to be called Middletown prior to 1808. 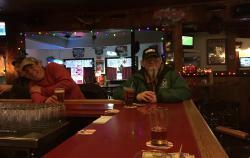 Middletown Tavern has been around for a long time, but not quite that long (since the 1980s). Transportation alternatives: Depending on the season, you’ll likely find snowmobiles and motorcycles in the parking lot. (Middletown is a popular halfway stop for the Honeoye Hill & Riders Snowmobile Club) How you get here is up to you. Best nights for wings? On Saturdays wings are discounted. Load up. 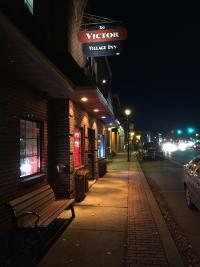 Why you should go there: Victor Village Inn may not be the only Cleveland Browns bar in the region, but it tries hard to be the most spirited. Best day to go to verify this fact: On Sundays during football season. And if you don’t like football? There’s pool, karaoke (call for the schedule), darts and chicken wings with your choice of 22 sauces. What can you drink? Anything from locally brewed craft beers to tried-and-true national brands. Why you should go there: What else are you going to do on a Sunday night (which happens to be the only night of the week that The Cracker Factory’s bar is open)? What’s free: Nearly everything except the drinks. Snack foods, billiards, and free advice from Geneva attorney Mark Venuti, who also happens to be the Town of Geneva supervisor. Why you want to tip generously: All tips are donated to the Boys & Girls Club of Geneva. Are crackers really produced on site? Nope, and they never were. This hipster post-industrial building houses an artisan furniture factory on the first floor and an events space and bar on the second floor. Why only Sunday nights? 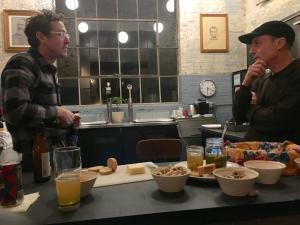 In order for the Cracker Factory to be in compliance with the law as an events space that serves alcohol, it has to be open as a bar at least once a week. The owners have yet to hold an official grand opening, which is why Sunday nights are referred to as The Official Unofficial on the Cracker Factory’s Facebook page. Why you should go there: Because Buffalo Bill’s isn’t afraid to mix metaphors. The locals describe it as a “mom and pop Irish pub that landed on a Western saloon ... in the Finger Lakes.” It also has crazy-good jambalaya. Football haven? Wild West showman? No, Buffalo Bill’s is neither a sports bar nor a rodeo show. The owner just happens to be named Bill, and he’s from Buffalo. His wife works there too. Her name is Robin. What will you experience there that you probably can’t experience anywhere else? Show up for Songwriters in the Side Room, a monthly concert series that highlights Finger Lakes musicians performing original songs. Sorry, no Lady GaGa sing-alongs. Why you should go there: This is a wine bar where they will be nice to you whether you’re a wine connoisseur or not. Plus, all the wines are $7 a glass, which makes the math a lot easier if you’re ordering in a group. But what if you’re drinking buddies crave beer? Beer lovers are welcome here too. In fact, there are several beers on tap and more by the bottle. Have a pint on site or grab a growler to go. What if we arrive hungry? Order some trendy yet reasonably priced small plates and dinners from Water Side’s talented kitchen crew. The house smoker puts out some fine brisket. What other fine distractions are on site? Water Side offers a great view of the Flint Creek waterfalls. 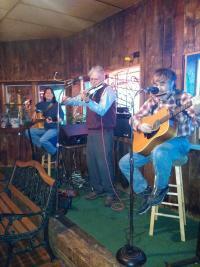 A few nights a week local musicians perform. When the weather is warm: Take that intermingling to the waterside patio tables and lounge chairs and fire pit under the trees. And order a fine pie from the seasonal outdoor pizza oven. When the weather is cold: Two fireplaces await you inside. 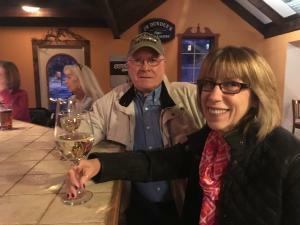 Why you should go there: Located in a sparsely populated stretch of state road, Vonnie’s is known as “the neighborhood bar without the neighborhood.” The space is small and intimate, and it’s easy to make friends here. How small? You probably have more bottled beer choices than seat options. What other diversions are there? 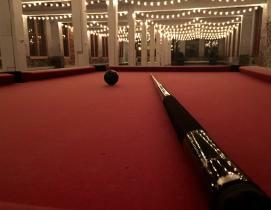 Pool, darts, and trivia on Thursday nights. Signature menu items? Everyone seems to love the Boathouse Burger, but the chicken wings and pizza are also popular. Bargain hunters take note: wings are discounted on Wednesdays, pizza on Mondays. Vonnie’s Blueberry Muffin cocktail is legendary. Is there really a boat on site? No, but across the road there’s Seneca Lake and a marina. Vonnie’s has embraced the spirit of being on the water with a boat-shaped bar and inner “dinghy” to hold the liquor inventory. 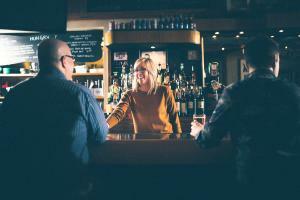 You can download our Where the Locals Drink card here. And if you want to learn about more cool places to grab a drink and bite to eat, sign up for our email newsletter here.